Red 5 have announced that they will be releasing their excellent series ‘Bonnie lass’ in print. Following the success as a digital comic they are releasing it as print comic in September – perhaps as a different option to any other #1’s coming out that month! Bonnie Lass is an excellent series and well worth the read – keep you eyes peeled for a spotlight review of the whole mini series soon! 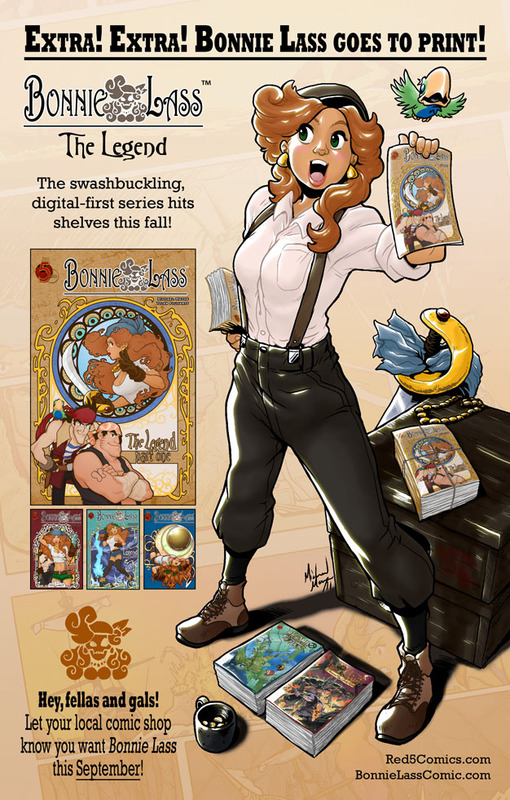 The acclaimed series comes to print, spinning the pure-fun yarn of heroine Bonnie Lass setting out to build her reputation as a pirate to be envied and feared. Bent on overshadowing her father, the infamous Cutlass, Bonnie’s after the one treasure he did not claim — the Eye of the Leviathan. Humor, beauty, misdirection, mash-ups and a leading lady to fall for sets sail on the open seas. It’s good to see publishers taking advantage of the digital option – although this is a new way of looking at it!